Following the shape of the black line, add a cream or gel bold liner right on top. We recommend Devezin Loose paints as shown above. The line should be the same thickness, or slightly thinner, than the black. Line the lower water line (the inner rim of your lashes) in teal or turquoise. You can also opt for a long-wear pencil for added staying power. Use the color just on the bottom, where it will be more noticeable. Lush lashes are the best complement to vibrant color, so load up on a voluminous mascara. Try my Devezin Natural Lush Lash Mascara. 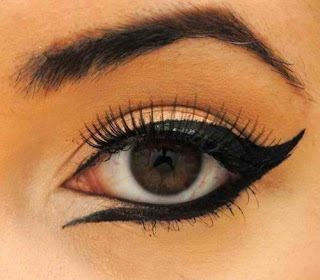 For some, the fear of smeared liner is their biggest reason to forgo trying the trend. If that's you, simply opt for matte shadow, which will stay in place far better than a creamy liner. 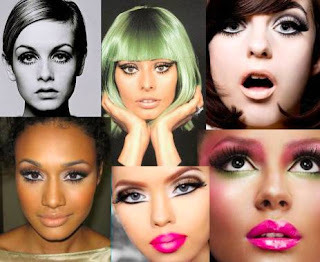 Just be ready for rouge shadow particles, so do your face makeup last.